Join Our Team: Apply for the TP Mechanical Apprenticeship Program! We will be accepting applications for our next class of apprentices Monday, June 4 through Friday, June 15 between 9 a.m. and 4 p.m.
We invite you to stop by the appropriate office location for the trade program you are interested in to complete the application process and schedule your interview. Bring a copy of your high school diploma, GED or a letter from school with an anticipated graduation date, and you will take a math test during the application process. All our apprenticeship programs are free and consist of a minimum of 8,000 on-the-job training hours and 576 hours of classroom learning over the course of four years. We also offer a wide variety of classes outside the core required apprenticeship classes to help you broaden your skills and challenge yourself. Additionally, all of our apprentices earn 20 to 25 credit hours towards an associate degree at Columbus State over the course of the four-year program. To earn your associate degree, you will need to take an additional 10 general education classes at Columbus State, or have your credits transferred to a school closer to you to complete your degree program. “Over the years I have had the pleasure of not only watching the apprenticeship program evolve, but have been lucky enough to have been involved in the program as an instructor,” said Tony Marple, Plumbing Services Manager in Columbus. Quality instructors, on-the-job training and teamwork – that’s the difference between our industry-leading apprenticeship program and other options. When you become a part of the TP Mechanical family, we invest in your future. Our goal is that you will be a vital asset to the company at the end of the four-year program. We want you to continue down a path of learning and experience to become a leader at TP Mechanical. To learn more about our apprenticeship program, visit http://www.tpmechanical.com/apprenticeship-program-detail/, or contact Jen Madden at 513-851-8881. TP Mechanical and the Ohio Valley Associated Builders and Contractors (ABC) were excited to host tri-state high school counselors this morning at our training facility. We spoke to them about our apprenticeship programs and career paths, as well as earning potential in the construction industry, so they can help educate students considering careers in construction. Our companies feel it is important to educate counselors because they are helping the next generation of workers discover the best option for them after high school. With the decline in young workers in the construction industry, these learning opportunities are critical to the growth potential and sustainability of our industry. John Morris & Cody Shaw speaking to high school counselors. TP Mechanical offers a four-year, state-certified apprenticeship program. Our apprenticeship programs all consist of a minimum of 8,000 on-the-job training hours and 576 hours of classroom learning over the course of the 4 years. We also offer a wide variety of classes outside the core required apprenticeship classes to help you broaden your skills and challenge yourself. Learn more about our apprenticeship program and career paths, visit www.tpmechanical.com. To learn more about Ohio Valley ABC, visit www.ovabc.org. At TP Mechanical, we want the success of our employees to go hand in hand with the success of the company. That’s why we offer a variety of four-year apprenticeship opportunities that blend in-class instruction and on-site job training. All our apprentices receive 8,000 on-the-job training hours and 576 hours of classroom learning from experienced instructors in areas such as plumbing, pipefitting, fire protection and welding. Our team is looking for apprenticeship candidates who have a strong work ethic, a great attitude and a willingness to learn. Many apprentices stay for long careers, due in part to our commitment of promoting from within our workforce. TP Mechanical is accepting applications for two weeks only: Monday, April 17 through Friday, April 28, 2017 from 9 a.m. to 4 p.m. in our Columbus, Cincinnati and Lexington offices. Bring a copy of your high school diploma, your GED or a letter from your school with your expected graduation date. We look forward to meeting you and starting the application process – click on the links above for our office addresses. Visit the TP Mechanical apprenticeship program page on our website or call our Training Manager Tracy Urti with any questions at 513-851-8881. At TP Mechanical, we recognize that the future of our industry depends on the training of skilled workers. That’s why we’re committed to training the next generation of skilled craft workers. TP Mechanical’s apprenticeship program and ongoing education initiatives offer employees the chance to advance their knowledge and expertise. The Apprenticeship Program’s success with employees is due in part to the combination of in-class and on-site job training. The in-class portion of our program is enhanced by quality instructors who have years of experience and were selected by TP Mechanical personnel. The on-site training takes place in the field where you will get the chance to acquire knowledge alongside their classmates. Our current group of apprentices will attend a recognition event on June 19, and those who have reached the end of the four-year program will officially graduate. 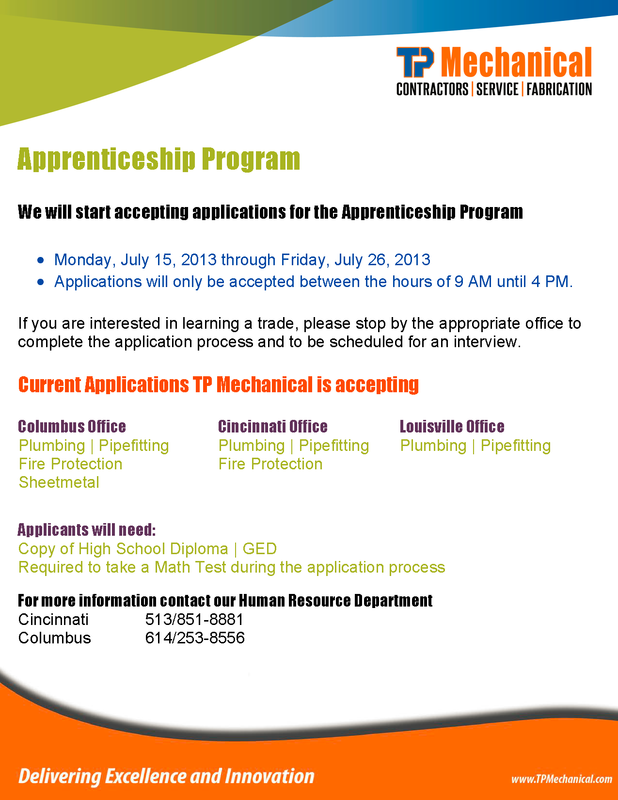 TP Mechanical will advertise for applicants to the next class of apprentices in June. Be on the lookout and you could be a part of the program next year. What is your path to Success? TP Mechanical seeks out apprentice candidates based on their commitment to the work, attitude and their desire to learn. Many of the people seeking to become apprentices are new to the skilled trade. Therefore, we provide the skills and training to make them successful. Our company leadership believes in developing our culture by promoting within and coordinates learning plans to build individual capabilities and our workforce. Three trade options are offered for extended training during the four-year Apprenticeship Program. Our apprenticeship program consists of a minimum of 8,000 on-the-job training hours and 576 hours of classroom learning over the course of 4 years. Contact Us for more information on the apprenticeship program. Start now on your path to success with TP Mechanical.